Ways to reuse old tires as posted by the ThriftyFun community. Please don't leave old tires laying around, they are mosquito breeding grounds if they are allowed to catch rain water. Store them indoors somewhere until you figure out what you want to do with them. If you do choose to discard them, check around. Where I live, you can't just put them out with the garbage, but the city offers an annual "tire amnesty day" (usually around Earth Day) where they will take them at no charge, and they are recycled. Just a caution about growing food in tyres. Tyres contain cadmium which fixes the colour in rubber. Cadmium, though little talked about, is one of the more poisonous of the metals in our environment. Potatoes are known to accumulate cadmium, as do cabbages, carrots, radishes, lettuce, turnips, tobacco, cocoa and peanuts. Obviously potatoes are a concern because they form a large part of most people's diet. As is the case with all heavy metal poisoning, the early symptoms are not noticed until it is too late. "The surface of used tires has been subjected to years of exposure to oxygen by high speed rotation in the atmosphere. This exposure causes a phenomenon called oxidation. Oxidation 'interlocks' the surface molecules with oxygen and 'out-gassing' (fly-away molecules of synthetic rubber) is considerably limited, if not stopped completely. It's the new tires that stink/outgas, they just need to "rust" for a while, before they are suitable for use as a building material." I made a hanging table with a tire. I bought a wood round the size of the tire. I drilled 4 holes through the wood and the tire. and hung it with heavy duty chain. I then hung the chains over a strong tree branch and bolted the chain together. I cut small holes in a couple of places in the wood for cup holes. I painted and sealed the wood. I now sit under the tree and even with the wind the glasses of iced tea don't slip off. I'm going to make another one as a hanging planter for shade loving plants. Same idea but smaller round of wood inside the tire to cover the bottom, a few drain holes and plant. Hang the same way as the table. Tires filled with earth and plastered over to create a walled enclosure with a roof will ensure the room made will take excess heat away from the room and, in times of cold, bring extra heat into the room. Such is the power of the tyre, no more lengthy power bills. I don't know how they do it, but I have seen where they take an old tire and cut it to make a tire swing that looks like a horse (complete with stirrups). It was at our local petting zoo. In Spain, I saw beautiful displays of geraniums in planters that were made from old car tires. They just cut through the middle all the way round and turn them inside out so they look like old fashioned egg timers. Paint the outside white, line the top part with plastic, stick in some soil, plant up and away you go! I've seen a beautiful strawberry planter made of tires. Stack them pyramid-style, so that they overlap leaving sections of the insides of the tires open for planting strawberries. Yum! The one I saw had the outsides of the tires painted bright colors. You can use whole tires, just like block walls staggering them. Start off with a level surface, dig down if you have to and start your first row, making sure it is level from one end to the other. Now comes the hard part, you have to pack each tire with soil and I mean tightly. I use a short handled sledge hammer. When you get the first row, done drive a 24 inch piece of 3/8 rebar at the back of each tire. Start your next row, staggering the tires so the lines do not match up and do the same thing all over. I have done one wall 90 feet long and 12 feet high 8 years ago and it is still solid as a rock. You need to plant a high fibrous root plant in each tire, I like red honey suckle as it cascades and hides the tires and the wall but monkey grass lariope does well also. We found a picture and want to replicate it. You take 2 or 3 old tires and place them one on top of another with a round of different shaped wooden board and either paint it or cover it with faux diamond plate. Use it as a nightstand or table top stand for a room or guys area. I have used old tires for planters and it works good. Just scallop around the tire and turn it imside out. When I was a little girl, my mom got a hold of a huge tractor tire, laid it flat on the ground and filled it up with play sand and we had a fun sand box! You can put a tarp over it when not in use to keep it from being the local "kitty box". I don't know where to find instructions, but I remember some kind of sandals where the soles were made from old tires. Here is a site I found to make the sandals. I also came across this other website that shows different uses for tires. Scroll to the bottom for different links. Hope this helps! Retaining walls on steep sloping land to prevent erosion - partially buried and planted into - the roots hold it all together. As a raised garden bed - arrange 2-3 tyres deep, as many tyres as you need for the size shape you want. As you lay each layer fill with good garden soil. The height/curved shape adds visual interest and the tyres themselves are quickly covered with foliage. The roots will find their own way between the tyres if necessary. As insulation - walls of a garden shed/root cellar - lay on top of each other in a staggered pattern like bricks - fill with earth to stabilise. 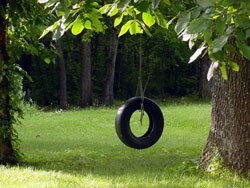 Garden swing - tied to a sturdy bough with rope. Decorative planters - there is a way to cut old tyres so they form a planter - there will probably be a link on the net as its impossible to describe without pictures! Tractor/large truck tyres can form a quite dramatic garden bed just filled with soil and used on their own - you can paint the outside to blend in with your garden. To define a bike riding course - for corners/chicanes. For edging garden beds - pleasing scalloped shape if cut in half circles. Paddling Pool - drape a shower curtain over the centre of a large truck tyre and fill with water to make an instant pool for small children. Cold frame - lay a tyre on its side awsy from direct sun - plant with seedlings. Cover the top with cling film but remember to leave holes on each side for ventilation. Planter - tomatoes, potatoes, aubergine (egg plants) and peppers can be grown inside tyres which have been laid on the ground. The tyres give wind protection aand the dark rubber helps keep the surrounding soil warm. If you are strong enough to be able to cut tyres into sections, they can be nailed to the garage wall at the same height as your car bumper to prevent scrapes. Strips of old tyres can be nailed to ramps and/or stairways to prevent slipping. Got a big dog? Put their dog dish inside a small tire and the dog won't be able to drag it around the yard. Cut in half and hung on a wall they make a hose hanger. Put a trash can in the center and you have a no tip container for baseball bats and other long sporting equiment. Stack to make a planter that you will be able to start plants in early because the tires will absorb heat and keep the bed warm or just paint the tire and plant right inside of it. Mount a tire on the inside of your garage wall for a bumper for that new driver (or the clumsy old driver:) ). Plant them half way in the ground and you can use them to set up a track for your kids and their bikes or you could line a long drive way and paint them with reflective paint. My father was a coach and athletic director. He would put a tire on a sand or clean dirt surface, line the bottom with newspaper (to keep the concrete in) fill the tire with concrete and add an upright pole. When dry, and with eye-bolts in the appropriate places, these could be used for tether-ball supports, net supports, etc., and could be easily moved from place to place as needed or into storage. The concrete made them heavy enough to make them stable enough for reasonable use. Adding eyebolts into the wet concrete will provide an attachment for tie-downs. Screwing the eyebolts into something, like a large nut or piece of metal, ahead of time would provide more purchase in the concrete. You could make them even heavier by adding another tire and filling it with concrete. If the tires are of different sizes, just make sure the larger in diameter is on the bottom. They could also be used as supports for tomatoes, beans, etc.. In case of approaching storms (hurricanes, ice storms, etc. ), they could be laid down with their plants still attached and then secured to the ground. They afterward could be stood back up with much less damage than would have otherwise resulted. You could cover them appropriately to add further protection from the approaching danger. They could be used as pup tent supports: use 2 supports, a clothesline, and a blanket. Voila! How about a clothesline? To take a hose across, use one support on either side of a driveway with a big hook-screw for the hose to run through. They could be used to provide support for shade material, like over newly transplanted plants. 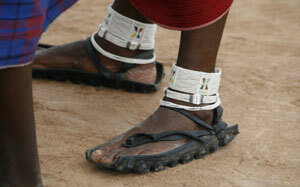 They could be used to provide support for a temporary fence, chains, cables, rope, etc.. I'm sure there are many more possibilities and refinements possible: have at it, folks!